Since entering my late twenties, I have become obsessed with keeping my skin as young-looking as I can manage without resorting to drastic measures. I’ve started drinking water (not that I didn’t but let’s just say, my consumption then was not admirable), I’ve started faithfully washing my face before I sleep no matter how tired I am, and using toners and moisturizers. While I have been loyal to clean and clear’s toner for the last ten years, I’ve been switching moisturizers every now and then. I started with Pond’s but it made my skin break out; tried Clean and Clear and stayed with it for four years until Olay got introduced to the Philippine market and I switched just like that. And it worked for me – I never got as many compliments as I did after I started with Olay. But as fickle minded as the next woman out there, I was tempted to try L’Oreal’s Therma Genesis, which made me regret the next two months as I was hounded by flaky skin, breakouts and itchiness. 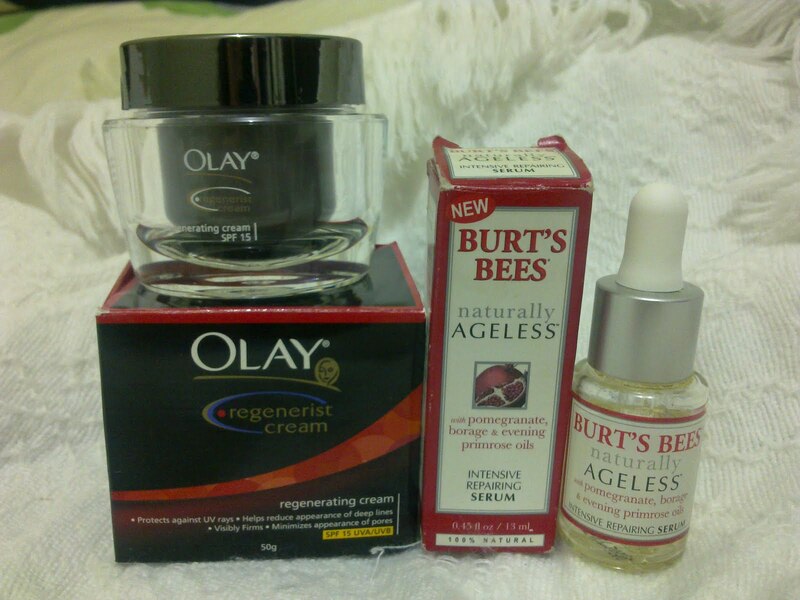 So, I switched back to Olay – this time, upgrading to the Regenerist line for my day cream. I have been using it for over six months and I am very happy with it – the compliments are starting to pour again and even my mama (who’s even more fickle minded by the way) was impressed. What I appreciate though is that it’s non-greasy and doesn’t make my face look like it’s been caked in something (which means, I am not a fan of pearl creams or chin chun su). Once I put it on, I can forget about it – no one ever notices it, except that my skin is brighter and my face powder doesn’t cake or shine too much. Another product I am swearing it on is Burt’s Bees Naturally Ageless Repairing Serum. I actually saw this in one of my magazines and since my mama has just asked me to buy her an anti-aging oisturizer, I decided to get one for myself. That was almost half a year ago – I didn’t want to post it here without seeing any results yet but I am pleased to say that laugh lines and crow’s feet are less pronounced. Even my forehead looks smoother. The only downside is it smells a bit oily, but then, that’s what it is – a mixture of pomegranate , borage and primrose oils, which I read are good anti-oxidants and helps the skin retain collagen. Which explains perfectly why my skin also feels more supple. I can’t honestly say exactly which has made this miracle – my grooming habits, my moisturizer, my facial wash/toner, or this serum – but they all seem to work well together that I am sticking to them for years to come (keeping my fingers crossed). * Olay is available at everywhere but Burt’s Bees products are sold at Beauty Bars.